It’s like I can’t get enough of it! Sometimes, I change things up a bit, though, like I’ll use sliced green olives instead of capers, or skip the capers and green olives altogether and add a few pieces of chopped red apples and a little bit of sharp cheddar cheese to the deal, to complement the raisins. 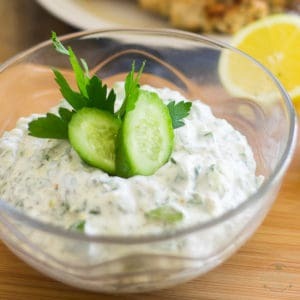 Sometimes, I’ll add a few tablespoons of finely chopped celery, for a bit of extra crunch. Other times, especially in the days right after I’ve whipped up one of my Dutch Oven Roasted Chicken, I’ll swap the canned tuna for leftover cooked chicken. 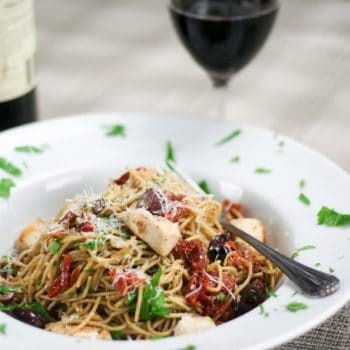 When using chicken, I love to swap the raisins for dried cranberries, or chopped dates. 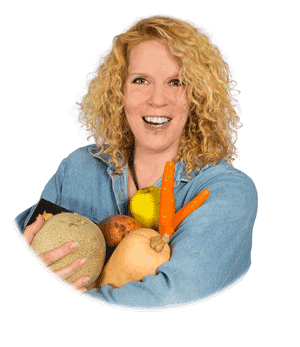 Walnuts are left out to make way for pecans or pistachios… And sometimes, I’ll do leafy greens instead of spinach. 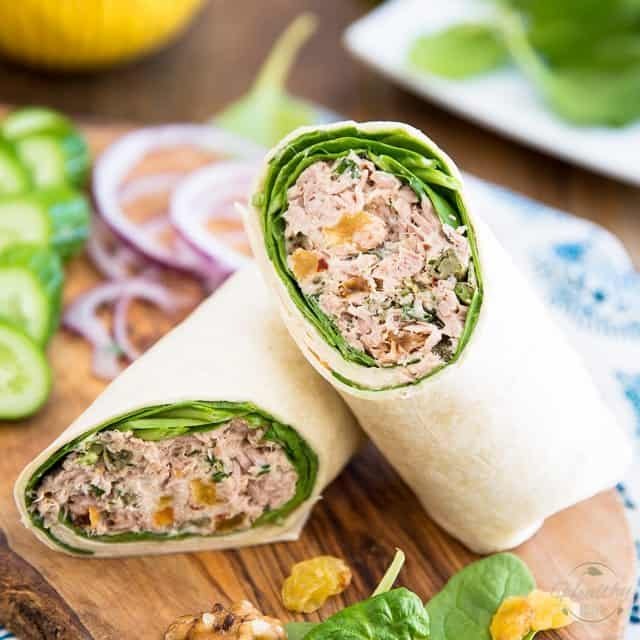 I’d forgotten just how awesome wrap sandwiches really are and just fell in love with them all over again. 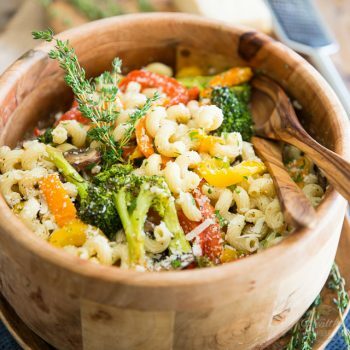 Not only do they come together in mere minutes, but they make for an awesome meal to take with you when you’re on the go. 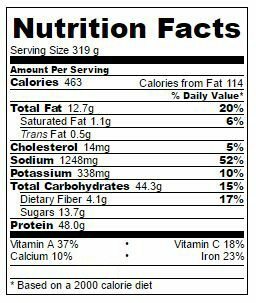 Very filling, very satisfying, and don’t need much of anything on the side: they’re a fairly complete meal in themselves. 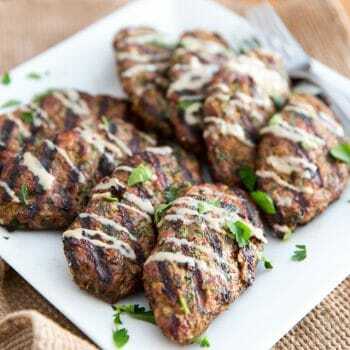 Plus, I’d say they make for a pretty brilliant post work-out meal, too! 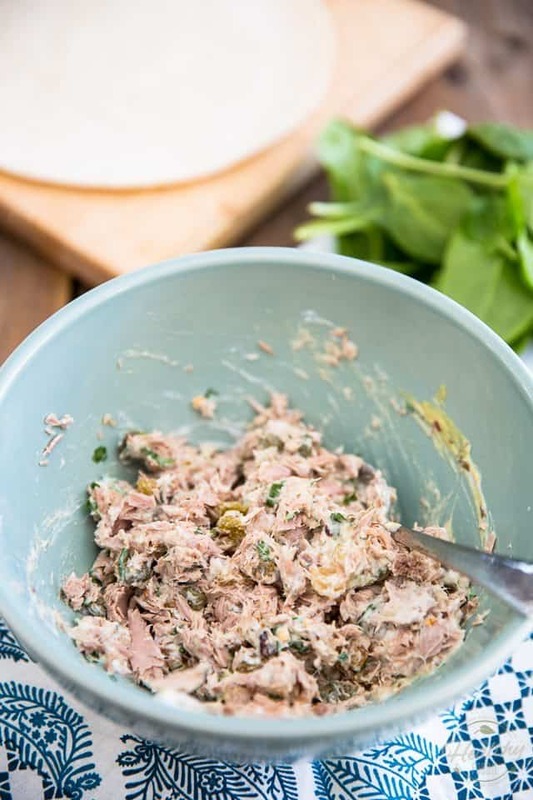 Combine the canned tuna (or cooked chicken), yogurt, Dijon mustard, chopped walnuts, raisins, capers (or green olives), parsley, salt, pepper and red pepper flakes (if using) in a mixing bowl. 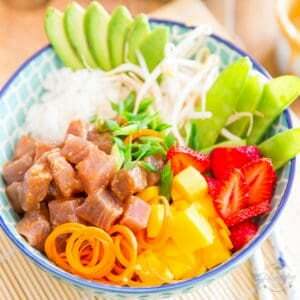 Mix with a fork until evenly combined. 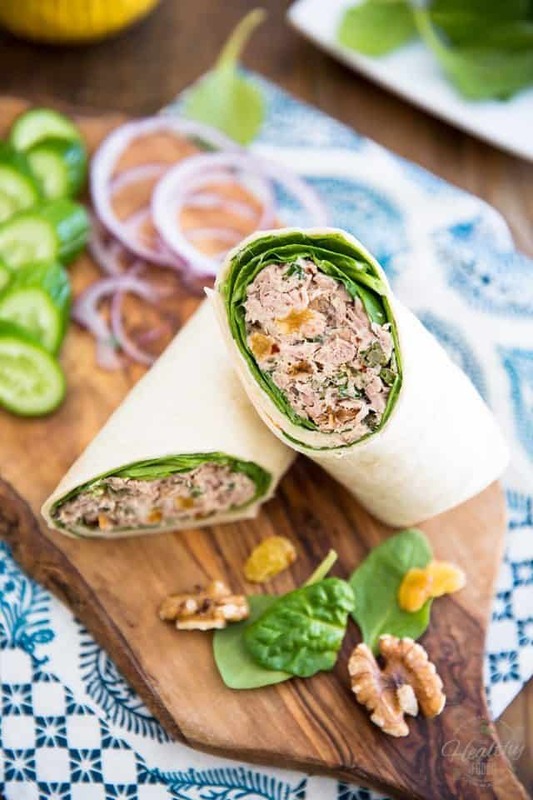 …and then dump the tuna fish salad right on top of the spinach. 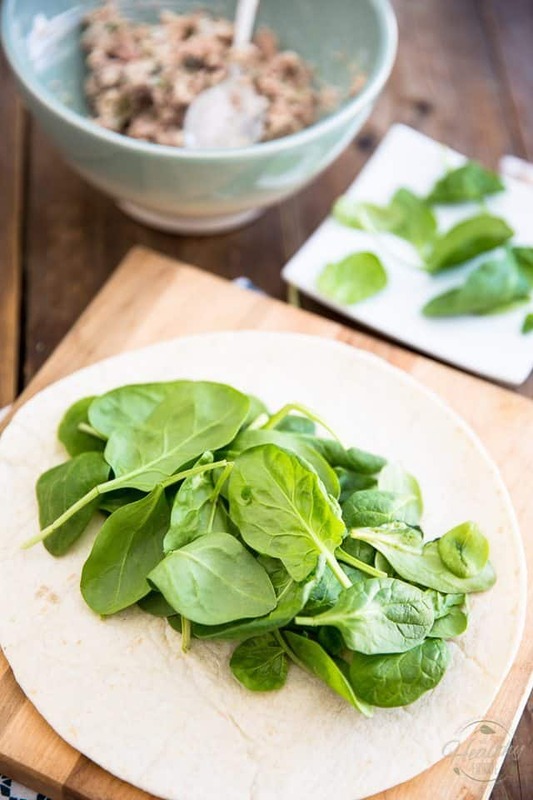 Not only will the spinach leaves add color, texture and lots of extra nutritional value to your sandwich, but they will also act as a moisture barrier and will prevent your tortilla from getting all mushy, should you decide to save your wrap for later. 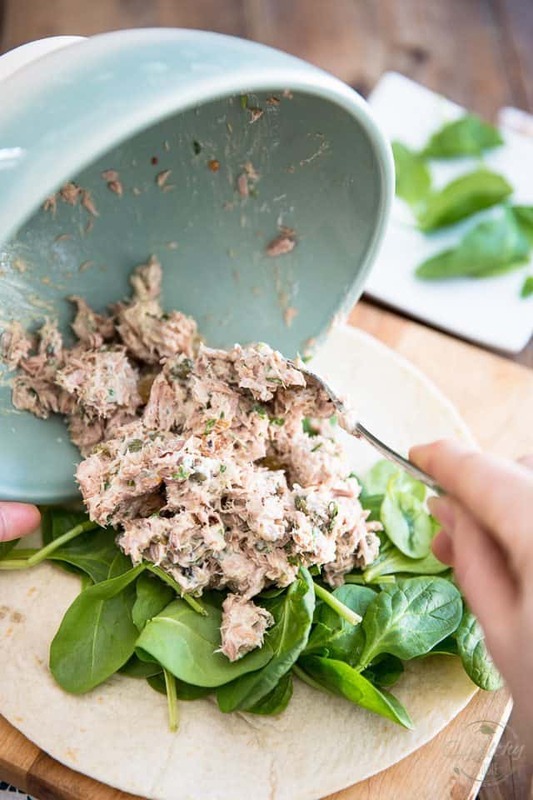 Just mound the tuna (or chicken) salad right in the center of the spinach leaves. Make sure it doesn’t go all the way to the edge. 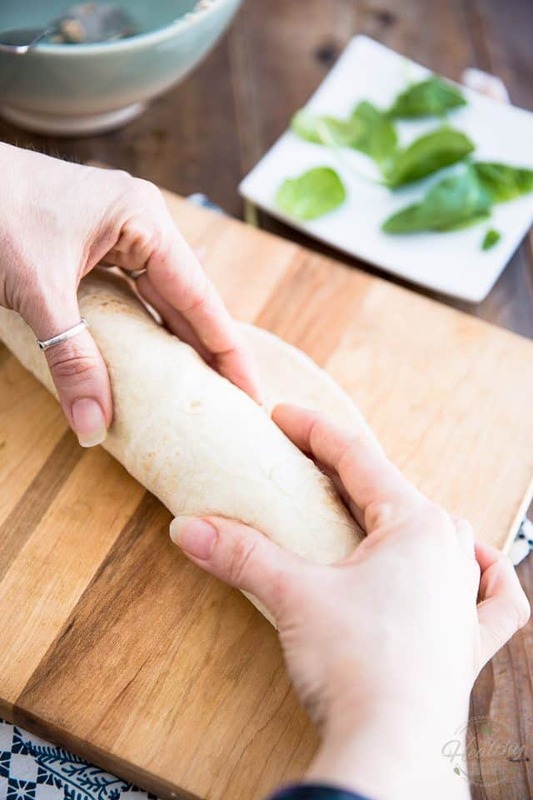 …and then push gently but firmly with the side of your hand to form a tight roll. At this point, you want to tuck the ends in so they get sort of trapped inside the roll. 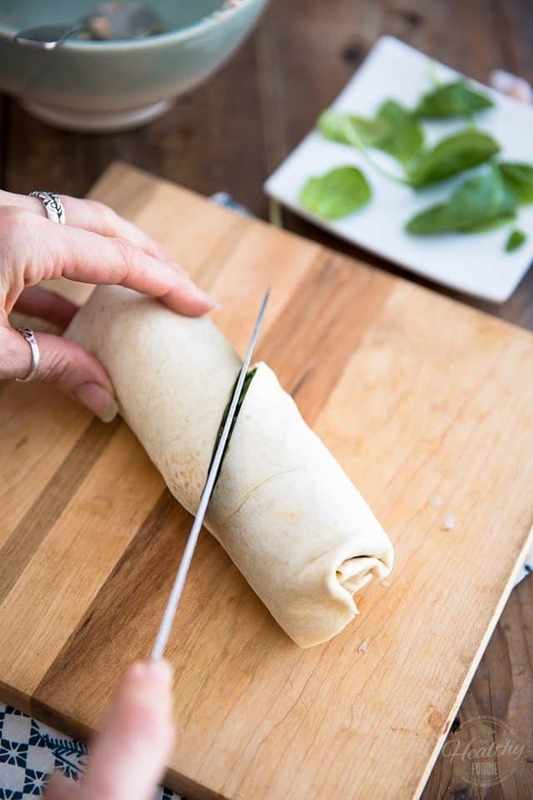 This simple precaution, along with the fact that soft flour tortilla are naturally kind of sticky, will ensure that your wrap stays nice and sealed after you finish rolling it into a tight wrap. 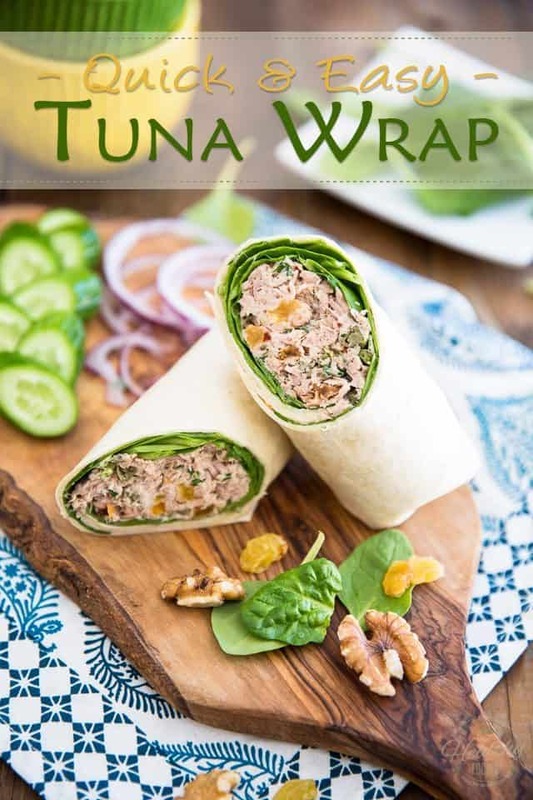 Slice your finished wrap on a diagonal and enjoy it right on the spot or wrap it tightly in plastic film to consume later, preferably within a day. 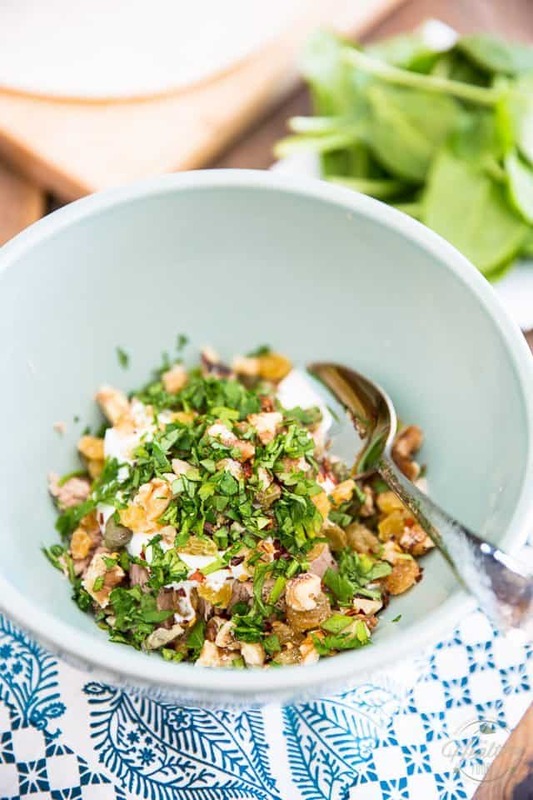 Combine the tuna, yogurt, Dijon mustard, chopped walnuts, raisins, capers, parsley, salt, pepper and red pepper flakes (if using) in a mixing bowl. 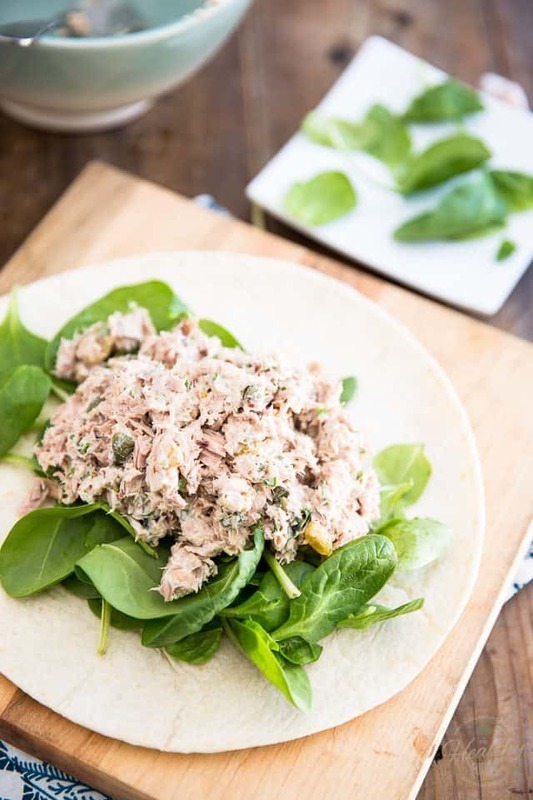 Place the handful of spinach leaves in the center of the flour tortilla, then dump the tuna fish salad right on top of the spinach. 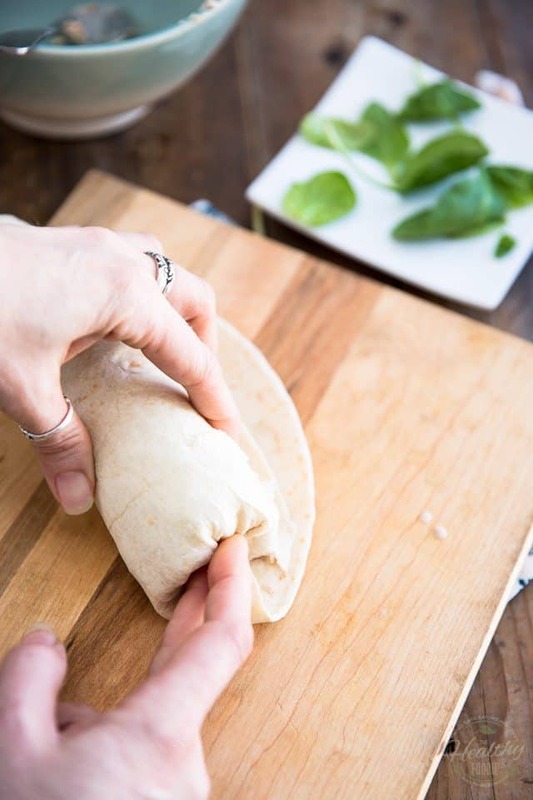 Fold the tortilla over the salad and then push gently but firmly with your hand to form a roll. 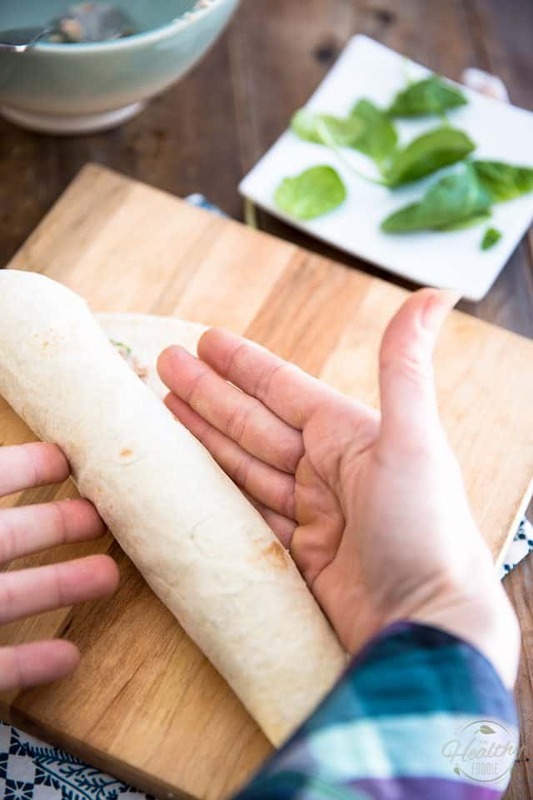 Tuck the ends in and then finish rolling the tortilla into a tight wrap. 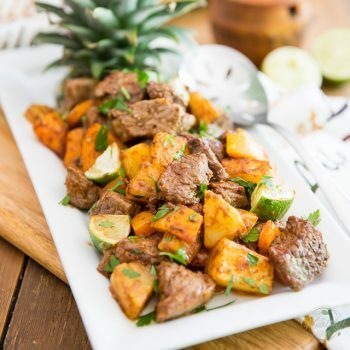 Slice on a diagonal and serve immediately, or wrap tightly in plastic film and consume within a day. roasted garlic vinaigretteroasted garlic vinaigrette it was so much moister. 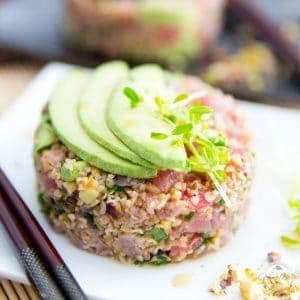 I have so much tuna in my pantry right now and have just been throwing them into my salads, but looks like I need to give this a try! Looks good. Can I make a bunch of these and freeze them and them microwave when needed? 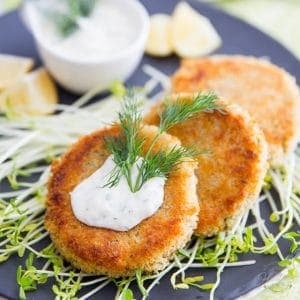 Merci beaucoup pour cette recette Sonia.